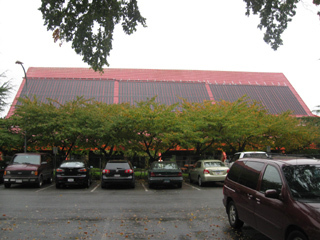 Beginning in 1986 we started with a solar heating product called Solarmat made in Vancouver BC. Our intrigue came from the fact it was a 4x8 (3 sq m) solar collector advertised for $99. At low temperature water heating conditions it collected almost all the solar radiation that fell on its surface. All hot water heating loads begin as low temperature loads. The solar radiation that falls on 3 sq meters in Vancouver or Toronto in a year is 14GJ and one GJ of natural gas including burner inefficiencies is or was about $10. No other solar or clean-tec option had that kind of free market potential. This was the technology concept we hitched our wagon to for exactly this reason. The math here says we can do solar at a one year payback! 28 years later here we are with what we consider to be the world's most advanced and well developed solar thermal solution. 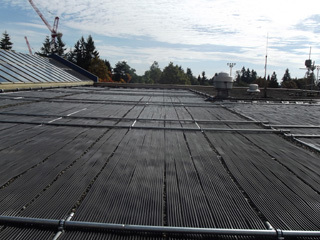 We've developed ways to secure our systems to roof spaces with the integrity of the roof and esthetics as primary considerations. Not only have we developed the solar collector system itself and how to marry it up with all the different roof and other mounting possibilities. We've also learned how to marry solar thermal up with pool and other mechanical systems. Its important to not cause excess pump operating cost or stress to existing equipment. More recently we've broken through the municipal solar barrier. We're finally starting to see acceptance of solar on municipal facilities. Its the largsest scale projects with the largest water heating and pool heating loads that we have the opportunity to really collaborate and learn with others. These projects taught us that there new possibilities and new arenas to explore with our technology. Our day to day mission remains to exploit low temperature applications where our simple collector technology can be very competitive with fossil fuel alternatives allowing solar thermal energy uptake a starting point. On a broader scale we seek to use our web based control and monitoring capability to help quantify all things clean tech in partnership with our Canadian colleagues at Renew Energy and Vancouver Renewable Energy and Argosy Pools and London Solar and Bright Energy and many others. The Powerstrip solar collector carries CSA's highest perfomance rating factor of any solar collector including boxed and glazed and evacuated tube! We are now on a mission to document the viability of all things energy. We're basing our comparisons on the up front capital investment compared to the annual energy production. For example a solar pool heater that is 50 square meters will deliver about 50GJ in a season if used fully, depending on location. We'll prove that with dozens of monitored sites. 1GJ=278 kwhrs and a system that size will sell for about $6000 making the ratio about $0.43/annual kwhr. In the clean tech world something is usually considered viable when the up front capital cost to annual energy production is about 1. In other words one dollar in capital cost delivers 1kwhr each year. By that measure one could say that residential solar pool heating with Powerstrips is viable. When we look at various energy technologies compared this way we get a sense of relative economic viability. This forms the foundation of the understanding required to move on the road to a sustainable energy future. Just saying "Its good for the environment" simply isn't good enough! solar electric system (PV panels) $4/watt and 800 hrs equivalent sun/year in BC gives us about $5.00/kwhr before any rebates. This number is why we stayed away from solar electricity and focused on solar thermal. History has proven this to be a bad business decision. PV thrived with subsidies and solar thermal died a slow death at the hands of high temperature solar advocates afraid to admit their economics. The above comparison shows why solar electricity is not a common sight in BC. In Ontario the electricity sold back to Ontario Hydro is worth 10 times what it costs and that makes the industry there viable if you don't count the cost to taxpayers. $5/kwhr becomnes $0.50/kwhr due to that FIT incentive. Call London Solar to take advantage of that opportunity in Ontario, Canada. We can now compare some solar thermal applications and see how solar thermal can stack up. Keep in mind that solar thermal projects normally displace natural gas. This is a good comparison if the metric is damage to the planet but for an economics comparison we have to add the fuel cost factor and often natural gas is half the price of electricity or even 1/3. Its when we can displace electricity (or propane or higher cost natural gas) with solar thermal that we can take advantage of the following on a direct comparison basis. 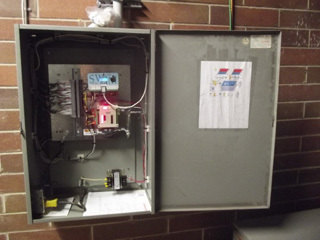 Residential solar hot water system that costs about $8000 installed and deliver 9GJ/year. This translates to $3.20/kwhr. Minoru Aquatic Center where the scale of hot water heating was high and the collector choice was Powerstrip. This system can be done at a ratio of $0.50/kwhr. Indoor pool combo pool and hot water system - year round in Burnaby, BC (data coming after first year) Preliminary estimate $0.50/kwhr. Outdoor municipal pool $0.65/kwhr tallied by the DDC system but the pool was very leaky and we don't have data for the leak free pool situation yet. Residential outdoor pool in BC $0.43/kwhr KNOWN VIABLE Even though the scale is smaller and balance of system costs are proportionately higher, design costs are lower and these pools can be heated for longer seasons than municipal pools and temperatures can be allowed to fluctuate more. This data so far illustrates why solar pool heating is very popular for residential pools. The lesson should be that people figure this out. There's no point hiding from transparent data monitoring. Data just moves things forward quicker. You can't fool the market indefinitely. The case studies and monitored sites profiled will help us evolve our understanding of when and how to fit various technologies into what we're doing on the road to acceptance of all things clean tech. What we see before we begin is that the installation we did at the Minoru Aquatic Center stands out as something important. When we heat lots and lots of cold water we shouldn't be using fossil fuels until we've prewarmed that water up as much as we can cost effectively with Powerstrips first. This is the first thing we should be doing and we should be doing it at every major hot water consumption venue, every hotel, laundry, car wash, prison, and of course Aquatic Center. The second thing we should be doing is every multifamily complex with central hot water and eventually we'll have a good system even for homes. Residential solar hot water should be way down the list but in BC its been right at the top throughout all rebate programs and incentives. Now solar thermal is considered dead in BC. According to us this is exactly why. Economics matter. The solar industry needs to confront this demon. Solar's economics can be poorer because of environmental considerations. Of course we should include environment in the argument but we can't use environment as the only metric. That's what we've always done in BC and its prevented us from taking a more intelligent path forward. What these numbers illustrate is exactly why residential solar thermal appliances have failed in the marketplace. The more advocates fudge or hide the truth, the more the industry's reputation is hurt long term and other good opportunities in solar thermal are missed. Our mission is to quantify energy so that incentive programs of the future can apply solar investments for maximum useful impact.